3. No longer an “Ex-Pat”……New home…….Now a “Re-Pat”! So I haven’t posted since June! Sorry about that, but packing up for an international move proved more time consuming than I’d hoped. I’m now back in the UK after 14 years away (this time!) and it’s hard adapting to the weather! And to a country which although my “home”, I have only lived in sporadically for the last 37 years and it’s quite a culture shock. We are still awaiting our shipment with all my art materials, although I made sure I brought back a selection of tools and supplies in my suitcase to keep me going! Most of the painting I’ve been doing since I’ve been back has been of a different “genre”…..walls and paintwork! As we are trying to renovate our house. Last week I started a children’s book illustrating course (The Craft and Business of Illustrating Children’s Books) with the Children’s Book Academy http://www.childrensbookacademy.com/ Our main teacher Mira Reisberg is very enthusiastic and a mine of information. I’ve always wanted to get involved with book illustration (I’ve done a couple of book covers in the past, just for local organizations). A couple of years ago my daughter and I wrote the outline of two children’s books and I am working on the first of those on this course. It’s been quite liberating for me as I always paint and draw from life, or photos in front of me and this time I am drawing from my imagination with the addition of some source material as necessary. My husband is getting used to me asking him to make a certain sort of expressive face or pose! It’s a very intense course but great fun. Go look at their website above if you are interested. 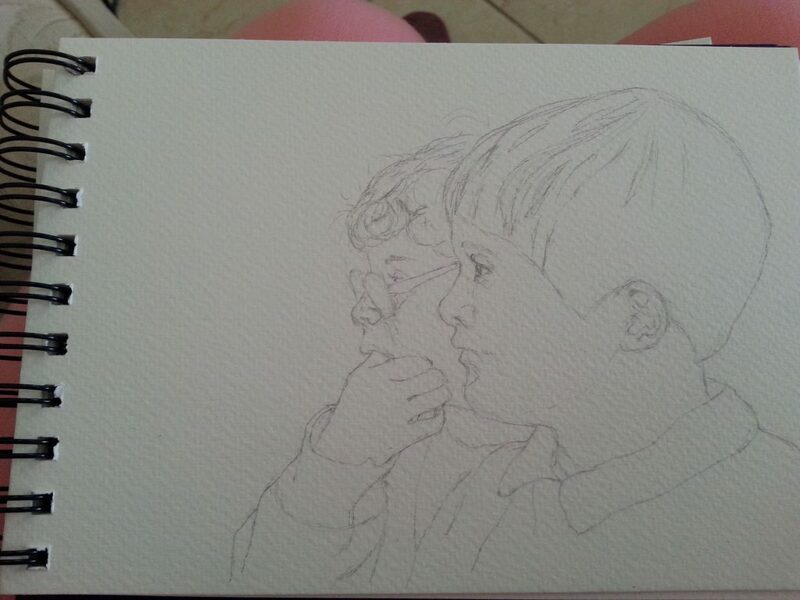 This is the first stage of a watercolor sketch from a photo of two of my children watching TV. The following few images show how this sketch progresses. ” ‘CS & AS’ Watching TV – watercolour sketch stage 1 outline” by Carie Sauzé 1. I make a light sketch and then refine it with an 0.5 refillable pencil and erase the lines I don’t like. I also add some shading hints for myself. I keep it very light as I will erase these pencil lines when I’ve finished. 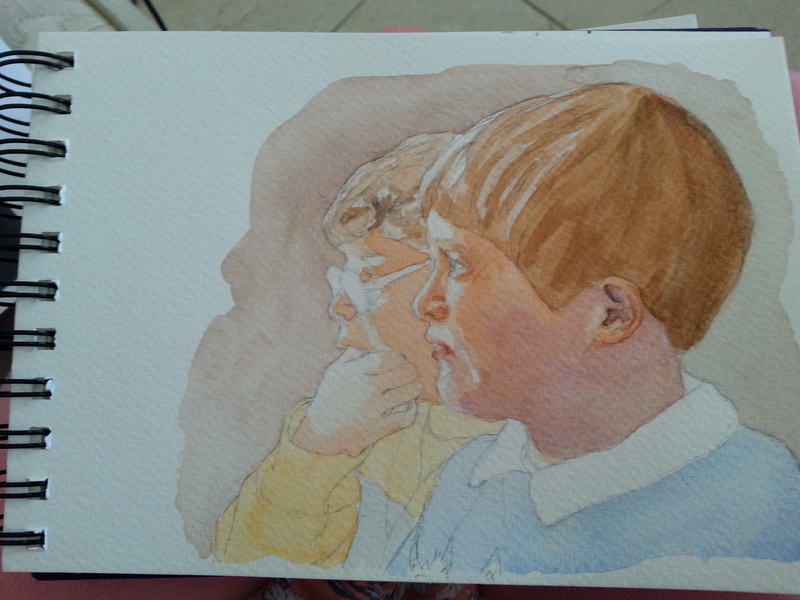 ” ‘CS & AS’ Watching TV – watercolour sketch stage 2. First background wash” by Carie Sauzé 2. In this stage I have just added some background in order to show up the subject better, normally when working on a painting (not just a sketch) after the drawing stage I would look for the white highlights that need to be preserved and I would apply masking fluid to them at this point. 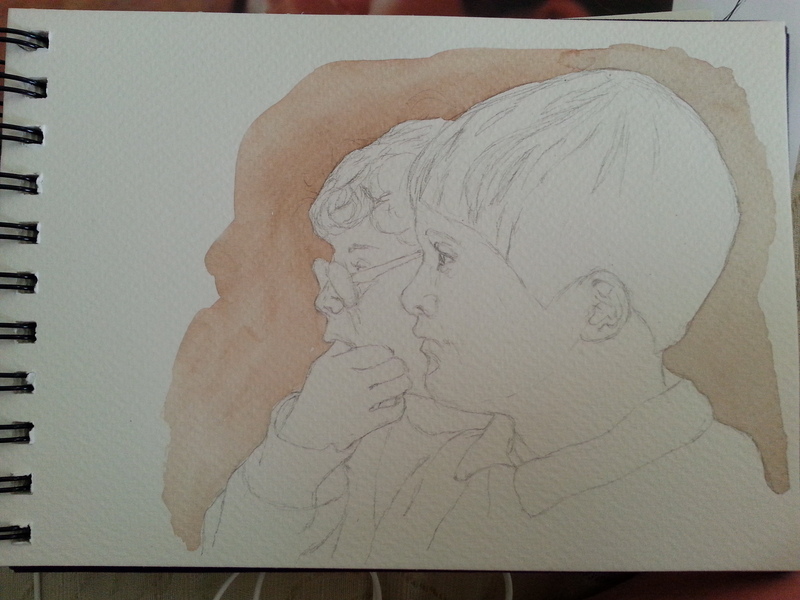 ” ‘CS & AS’ Watching TV – watercolour sketch stage 3. First overall wash” by Carie Sauzé 3. The first layer of watercolor on the figures. I leave the highlights white. This stage is really just to mark what colors will go where and acts as an “aide memoire” for me. 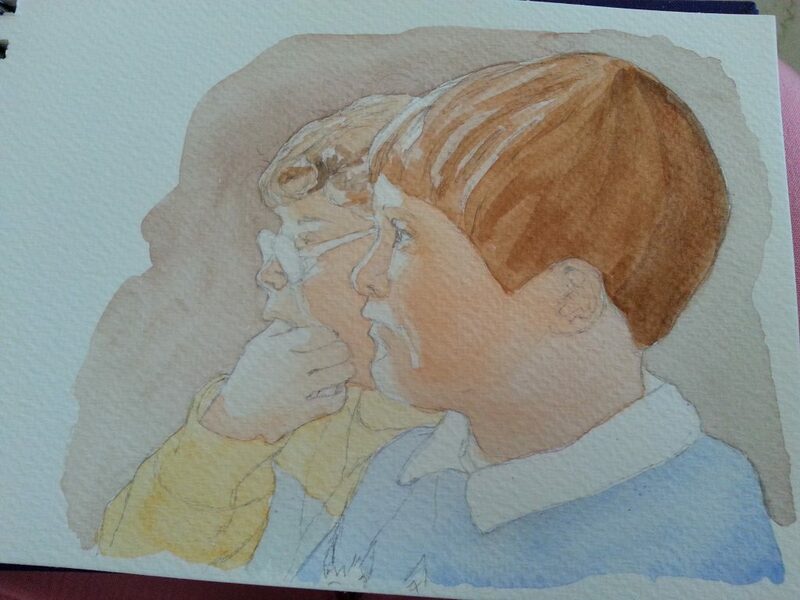 ” ‘CS & AS’ Watching TV – watercolour sketch stage 4. Second layer wash. by Carie Sauzé 4. This is the second layer of watercolor building up the skin tones on faces and hands but I haven’t done the clothing yet. 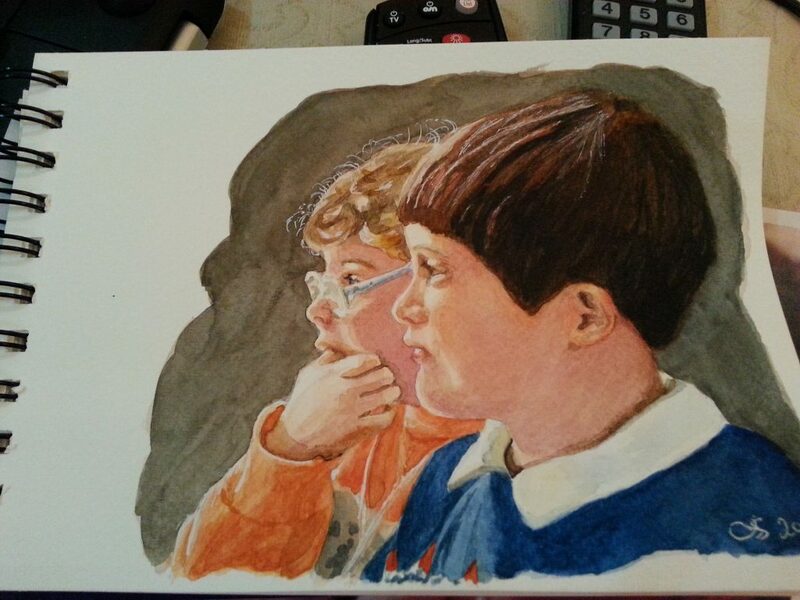 ” ‘CS & AS’ Watching TV – watercolour Stage 5. Finished sketch.” by Carie Sauzé 5. This is the final stage for this sketch. I like the expressions, but the boys hair would need to be adjusted if I work it up to a full painting, as it looks a bit like a hat plonked on his head. But he he that’s what sketches are for…to learn from your mistakes! Copyright © 2019 Carie Sauzé Paintings. Powered by WordPress and ThemeGrill.